Ownership of a full-size rear-wheel drive V8 powered four-door luxury car was once an aspiration held by many. After World War II, the U.S. Economy boomed allowing many Americans to buy luxury cars. Cadillac, Lincoln, and Chrysler flourished selling as many of these big full-size V8 powered cars from the early-1950s to the early-1970s, they could produce. It was the 1973 oil crises and the enactment of the Corporate Average Fuel Economy (C.A.F.E.) that put the final nail in the coffin for these big luxury cars. You may ask why this is so important in 2011? And there’s a simple answer, 2011 is the last year a big traditional American luxury land barge will be produced. The car is the Lincoln Town Car, which has been around for many years. It is a big rear-wheel drive V8 powered 4-door sedan that fits six people comfortably and still even has a solid axle just like the old days. It’s the only luxury car that has stayed the course – both Chrysler and GM gave up on these cars years ago. The Town Car is the biggest American car available for 2011 with a length of 215.4 inches, width of 78.5 inches, height of 59 inches, and a wheelbase of 117.7 inches. And in case that’s not big enough there’s a long wheelbase version of the Town Car which has been available since 1999 that has a length of 221.4 inches, width of 78.5 inches, height of 59 inches, and a wheelbase of 123.7 inches. Lincoln has thrived with the Town Car ever since its competition disappeared. However Ford has decided to pull the plug on its rear-wheel drive full-size Panther platform that is used by the Lincoln Town Car and Ford Crown Victoria (which is currently only available for fleet sales). The now defunct Mercury Marquis also used this platform, the Marquis was put out to pasture in January when Ford shutdown the Mercury division. Ford has not really done much to these cars for the last decade and has merely sat back and watched the profits roll in. However that philosophy does have a price, eventually the customers disappear when a car is not updated and the Lincoln Town Car sales have been slowly moving downward. Lincoln could of course do a through redesign and update of the Town Car and sales would rebound, unfortunately Ford has made its final decision and the body-on-frame Panther platform is not part of its future. Getting back to the competition, Chrysler was the first to fall, ending production of its full-size rear-wheel drive New Yorker at the end of the 1981 model year. Even the revered Imperial by 1981 was still a decent size however it was only available as a two-door to compete with the popular Cadillac Eldorado. 1981 was the first year of the small front-wheel drive K-car (K-body) platform for Chrysler. This platform is what most of the Chrysler Corporation’s offerings for the 1980s were built on including its front-wheel minivans. For 1982 the Chrysler New Yorker moved to the smaller rear-wheel drive M-body which was a mid-sized car platform and a lot smaller than the 1981 New Yorker’s full-size R-body platform. And for 1983 the Chrysler New Yorker moved to the front-wheel drive K-body platform while the Chrysler New Yorker Fifth-Avenue model remained on the rear-wheel drive M-body platform. For 1984 Chrysler dropped “New Yorker” on the M-body and shortened the name to “Fifth-Avenue” which remained until the end of the 1989 model year when the M-body Fifth-Avenue was laid to rest. After that Chrysler would not have another rear-wheel drive offering until the 2005 Chrysler 300. 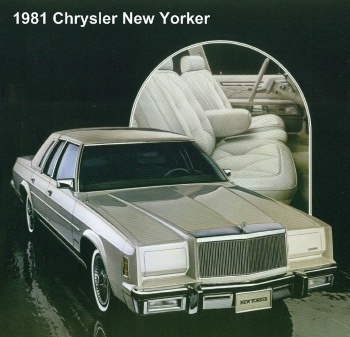 The 1981 New Yorker was 221.5 inches in length with a wheelbase of 118.5 inches which respectively is the same length as the long wheelbase 2011 Town Car and the wheelbase length is in-between the short and long wheelbase 2011 Town Car. It was a plush boulevard cruiser, loaded with amenities. The New Yorker had a ride as plush as its interior. This car was not made for the turns, it was a car made to spoil in luxury up to six passengers and provide massive trunk space for lots of luggage. It may have been thirty years ago since the full-size New Yorker departed however its comfort and great ride would please most 2011 Lincoln Town Car owners. The only real differences would be some technological advances especially when it comes to the engine and transmission. The Chrysler New Yorker came standard with a 318 CID (5.2 liter) V8 with a 2-bbl carburetor producing 130 horsepower and 230 lb-ft of torque which was par for the course in those times of anemic V8s. There was an option 4-bbl version of the 318 which produced a respectable for the times 165 horsepower and 240 lb-ft of torque, however before you get excited this moved the 3,911 lb New Yorker from 0-60 mph in about 12 seconds. The Town Car has been equipped since the early-1990s with a 4.6 liter single overhead cam (SOHC) V8 which has provided over the years good power and fuel efficiency for a V8. For 2011 the Town Car’s sequential multi-port electronic fuel injected 4.6 SOHC V8 produces 239 horsepower and 287 lb-ft of torque. These numbers today when most V8s make more than 300 horsepower seem a little low, however this engine performs well enough to give the Town Car’s driver enough grunt to keep the big barge moving in and out of traffic with ease. In real world driving this is equates to performance of around mid-8 seconds 0-60 mph. EPA mpg figures are 16 city and 24 highway which is efficient for a V8. However these figures have not changed much over the last decade, for instance the new 2011 Mustang GT has a 5.0 liter double overhead cam (DOHC) V8 that produces 412 horsepower and 390 lb-ft of torque and has EPA mpg figures of 17 city and 26 highway. Ford could easily put this engine in a Town Car if it was staying around but it’s another sign of how Ford just left the Town Car alone. The outdated 4-speed automatic transmission is another sign – it’s sure a lot better than the 3-speed automatic that was equipped in the 1981 Chrysler New Yorker however still behind the times since most cars now come equipped with at least 5-speed automatic transmissions and some now have 6-speed automatics. It is absolutely amazing that Ford has gotten away with selling the Town Car which has a base price of $47,225 for the Signature Limited (short wheelbase) and $52,895 for the Signature L (long wheelbase) models with a 239 horsepower engine and a 4-speed automatic transmission. It shows the appeal of these cars is the plush luxury and large interior and cargo space. After-all where else can you get six full-size adults into a car in comfort or have 21 cubic feet of trunk space? Toyota’s Avalon is a competitor of the Lincoln Town Car, you can fit 6 adults in an Avalon but they will be crammed into the interior unlike the Town Car which provides plenty of room between shoulders. Toyota has a big trunk with 14 cubic feet of space however it is tiny compared to the Town Car. And though the Avalon makes more horsepower, 268 from its 3.5 liter V6, the torque is 248 lb-ft which is about 40 lbs short of the Town Car. Believe me it does make a difference, lots of low-end of torque is what luxury buyers have craved since the inception of these big cars many years ago. Though Toyota’s front-wheel drive Avalon is a fine product it just does not cut it for tradition big car buyers (it’s more of an extended wheelbase Camry than a traditional American car) which is another reason why the Town Car will be missed. To get another perspective, GM cancelled its full-size rear wheel drive cars when the 1996 model year ended. This spelled the end of the big plush rear-wheel drive Cadillac Fleetwood which was the last of the full-size rear-wheel drive Cadillacs. Back when Cadillac was king, anyone who was someone bought a Cadillac. It was celebrities like Elvis who wanted the best money could buy, so they purchased Cadillacs. The 1996 Cadillac Fleetwood was just the kind of car Elvis loved – a big comfortable car with lots of amenities and luxuries. Cadillac has not made a car like this since and has no future plans to make another. The Fleetwood when it was cancelled was the largest production car you could buy in the American market; it had a length of 225 inches, wheelbase of 121.5 inches, width of 78 inches and a height of 57.1 inches. So you can see this Caddy was slightly bigger than the current long-wheel base version of the Town Car. At 4,450 lbs the Fleetwood was also a tank; however it was equipped with a slightly detuned version of the LT1 5.7 liter V8 which was originally released in the 1992 Chevrolet Corvette. Horsepower was rated at 260 and torque was a mighty 330 lb-ft, 0-60 mph took around 8.5 seconds with the standard 2.56 rear axle. However smart buyers went with the optional towing package which gave the Fleetwood a performance rear axle ratio of 3.42 – these equipped Fleetwoods could hit 0-60 mph in about 7.9 seconds. Even with the granny 2.56 rear axle ratio the Fleetwood can’t be beaten in acceleration by the current Town Car. That’s not progress for the Town Car which has had around fifteen model years since the Fleetwood departed to fill the performance gap and hasn’t. Adding insult to injury the 1996 Fleetwood had an EPA fuel economy rating of 17 city and 26 highway which bests the Town Car’s current figures. And the Fleetwood also had a 4-speed automatic transmission showing again how even if Cadillac dusted off the 1996 Fleetwood making no changes, it would be a formidable competitor to the current Town Car. This only proves that competition is for the best. For the last fifteen years the Town Car has had no competition so Ford has no real need to keep the Town Car on top of its game by improving the engine, adding a new transmission with more gears, among other things. Even with these gripes the Town Car is still worth the money. Everything from the spacious cabin to its overall quiet nature to the ultra comfortable ride, make this car a pleasure to drive and ride in. The other cars on the road are Rock and Roll, this car is Classical Music – it’s soothing. The Town Car is the type of car you want to drive on a long cross-country trip. So it’s no surprise that the Town Car is a favorite of the chaffer companies in places like New York City. In a way it’s nice to see Ford not compromise with the Town Car all these years however on the flip side of the coin; I see a lot of potential with the Town Car just being thrown away when its production is terminated. Ford could continue to make the Town Car with a 400+ horsepower 5.0 liter V8, a 6-speed automatic transmission, independent rear suspension, some suspension tweaks, an updated interior, and an updated exterior. Such a car could sell for around $50,000 and go toe-to-toe with the best rear-wheel drive luxury sedans from Europe (which are a lot more expensive). A less expensive Ford version of this car would placate the police departments and taxi companies which currently don’t want to lose the big Crown Victoria. It boiled down to whether Ford was willing to change the formula and bring the Town Car up-to-date with the current crop of big rear-wheel drive luxury sedans from Europe. Of course the body-on-frame would have had to be replaced with a new large unibody frame (a task requiring a lot of development dollars). Ford chose to cancel the old Town Car rather than change with the times. Ford with the Town Car held out as long as it could using the original big luxury car formula, many years beyond what GM and Chrysler were willing to do. Credit should be given to Ford for this alone. Just like Frank Sinatra sang the song “My Way” many years ago, Ford with the Town Car took the song to heart and has done it its own way refusing to compromise. The Town Car is going out in style the last of its kind, the final stand against the current crop of compromised cars.